When prams cost as much as your first car. Looking for a vehicle with reclinable seats, multiple-point safety harnesses, lots of storage space, four-wheel suspension, a sweet turning circle, wheels that both swivel and lock into position and good manoeuvrability? Then look no further than your local baby store. That’s right. 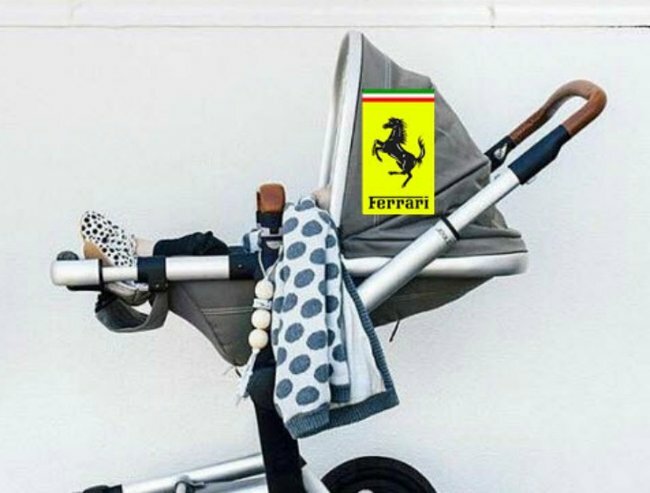 Prams these days come with many of the same features of cars – and price tags to match. It was only months after I’d gotten rid of my first car, the second-hand Barina for which I’d pored over pages and pages of The Trading Post in search of and then scrimped and saved to pull together the cash to buy, that I found myself in a similar situation. Sonny Blake in one of his three prams. 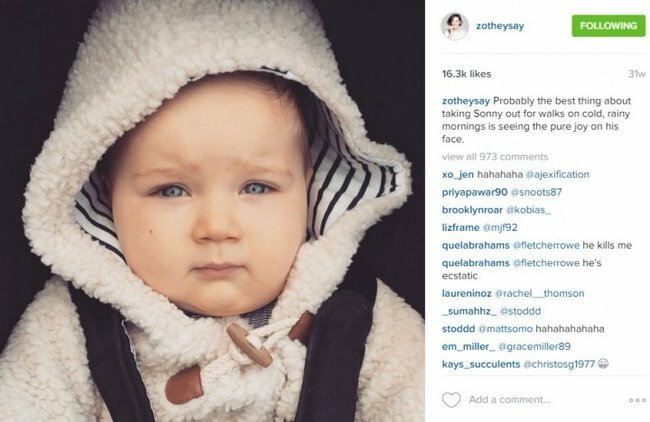 Image via zotheysay/Instagram. But this time, with baby in belly and completely illiterate in the language of pram makes and models, I had expected to fork out a whole lot less money. Then I went pram shopping and discovered that there are prams that sell for $2500. Seriously. Worse still, after being subjected to the sales pitches of those experts specially trained in bleeding parents-to-be dry, I could almost justify the expense. After all, if anyone deserves the best, it’s my unborn prodigy, right? And Kyly Clarke’s new bundle of cuteness and dribble, Kelsey Lee, obviously. This week the model and blogger proudly posted a picture on Instagram of the $1700 Joolz Earth Geo Mono, with matching $85 umbrella. While Bugaboo, favoured by celebrities the world over, was all the rage for a while, the tide seems to have shifted. Those cute names, like Bugaboo Bee, Donkey, and Buffalo, and special edition Andy Warhol prints have got some serious competition. These days, the Joolz is fast becoming the Ferrari of the footpath. Because what tot doesn’t need a fancy tan leather handlebar to drool over (both figuratively and literally)? But splurging on hardware for the unborn is not just for the famous among us; buying multiple prams for different purposes (like the three owned by Hamish and Zoe Foster Blake), or spending the equivalent of a first car on a carriage is not uncommon. 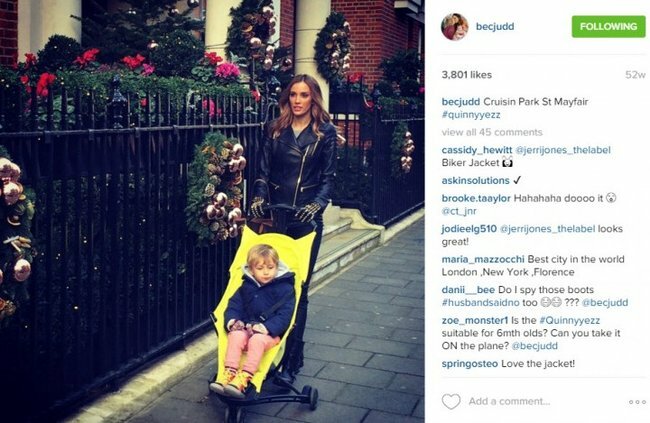 Bec Judd favours a Quinny while travelling. Image via becjudd/Instagram. It seems prams have become another way for us to signal to each other who we are, what we do, and where we sit in the parental pecking order. You can spot a Bugaboo’s iconic white circular logo or a Joolz’s distinctive leather handlebar a mile away. This is a land where prams are ‘buggies’ and drink holders are ‘liquid holsters’, and for some, only the very best will do. And I get it. Prams are a big deal. You are going to be accompanied by this thing every time you leave the house for a very long time – possibly years. And it’s easy to get sucked in by extras, like calorie counters (yes, calorie counters) and matching baby bags. For a moment, having an individually tailored Joolz – complete with hand-picked fabric colour, neon handlebar and carefully selected wheels – is everything. But there’s more to life than pimped-out prams. There are nurseries to decorate and designer baby threads to buy, after all. How much was your pram? Editor’s note: Please note that the featured image has been used from the following Instagram account: @oh.eight.oh.nine. You can view more of Tarina’s products at: http://www.oheightohnine.bigcartel.com/products.